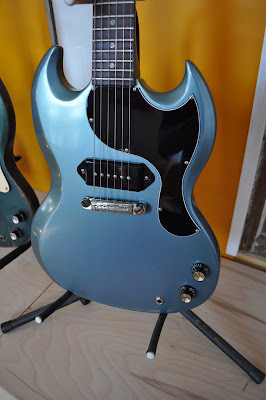 The Guitar Garage: 1965 Gibson SG Junior, Pelham Blue: Completed Finally !! 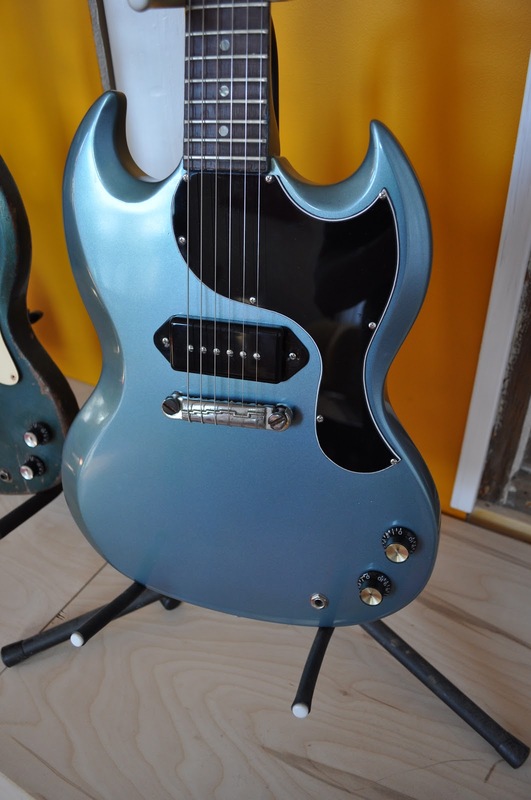 1965 Gibson SG Junior, Pelham Blue: Completed Finally !! Roughly four years ago, I acquired a much abused Gibson SG Junior and set about repairing some fairly brutal body routing prior to refinishing it in Pelham Blue. After a few misteps in the refinishing process - I set the project aside. 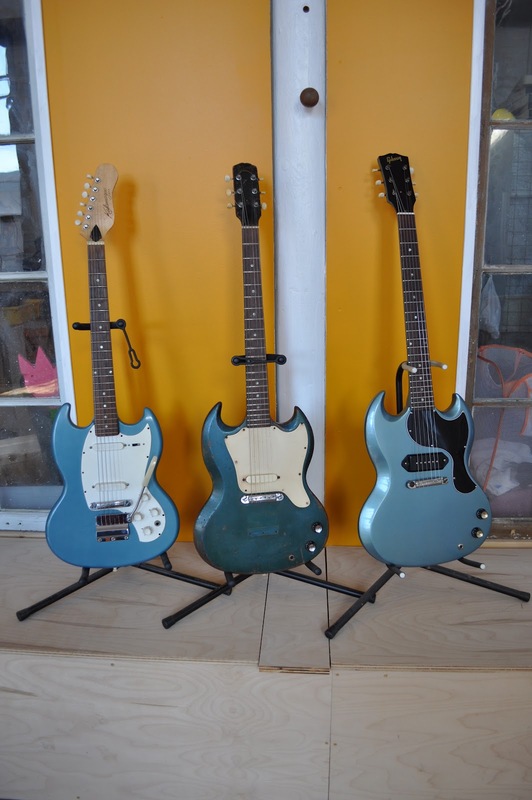 Meanwhile, I sold my house and moved the Guitar Garage to a new location in an old textile mill in Waltham MA and the poor old SG just sat leaning up against a wall. This past winter I decided it was finally time to attack this project again and finish it up. The initial steps in the repair of the body are documented in a prior post which you can read here. After doweling and epoxying in a block of mahogany - I used my router to cut a nice clean surface on the back where I could glue in a 1/4 thick pieces of mahogany to get a level smooth surface on the back. On the front, the glued in block was actually pretty smooth so I just used some epoxy to fill some gaps and glued in a piece of mahogany where the pickup cavity had been over-routed. Once the body was blocked up, I had to re-rout it for the correct control cavity and pickup cavity - as well as dowel and epoxy the oversized tuner holes in the headstock. I made a series of masonite templates to guide the routing of the control cavity and pickup cavity - tracing from an original Junior to get the correct shape and orientation. I routed out the pickup cavity first - and you can see that some of the original "floor" and cherry finish was still present. I traced the location of the control cavity routing ( I actually only had a tracing of the cover and cover location but used pictures I found online to define the cavity shape). Here's the control cavity routed along with the repro plastic cover I fabricated. With the repro pickguard in place. Note the serial number 282371 - which places this guitar as an early 1965 production instrument. This guitar has some attributes that differentiate it from later SG Juniors - most notably the fairly fat neck which is also wider at the nut than later years. The 1963 through 1965 SG Juniors also had a smaller control cavity than later Juniors - which had the standard full size routing that was common to SG Juniors, SG Specials, SG Standard, EB-0 and EB-3 basses and Firebirds. I believe the transition to the larger control cavity happened in late 1965. Despite the ridiculous routing to the body - this guitar had never suffered a headstock crack nor a heel crack - and had not been routed out for a neck position pickup, so the longer neck tenon was intact. Once all the woodwork was done - I started using the standard procedure for finishing a mahogany guitar - which means filling the grain, sanding, then spraying several layers of sanding sealer and then sanding again until the grain is completely filled. I have detailed this process in other posts, so I didn't document it here. Here's the body getting an initial coat of Pelham Blue - note that there is no primer coat, as Gibson didn't use primers for their custom color instruments. After this step - I applied a tinted clear coat to the body and neck - which gave it more of an "aqua" color - a strong green tint. I liked the color, but I ended up having some clear coat pool at the bottom of the heel joint - which just did not look right. As I was getting very busy with other work, I put the project aside. After revisiting the guitar a few months later - I could see that the color coat had fully cured - and shrunk - and now not only was the mahogany grain visible in places, but so were some of the seams from the fill blocks. In frustration, I put the project aside once again. I ended up using an oribtal sander with 320 grit to sand down the front and back of the body - and then a block to do the edges and neck - finishing up with a lot of hand sanding. In some places I went through to the clear sealer coats, in some there was still some yellowed topcoat visible - but I made sure that everything was completely level before spraying several more clear coats on the entire instrument followed by careful wet sanding. I also finally sprayed the headstock face black and applied a repro decal and numerous clear coats to hide the decal film. At this point I felt pretty certain that the mahogany was extremely well sealed and that the routing repairs were as invisible as they were going to get. I applied two thin coats of Pelham Blue lacquer (from TCP Global) - and then immediately clear coated the finish. In my experience its NOT possible to sand a metallic color coat at all - you have to lay down a nice even color and finish - using lots of thinner and maybe a touch of 3M's "Smoothie" - and then rely on the clear topcoat for achieving the real glossy finish. After a few days - I then carefully applied a tinted clear coat - which was clear gloss lacquer primarily tinted with Stew-Mac's "Vintage Amber" dye, with a small amount of "Brown" and "Cherry" added to so that the lacquer had the color of dark honey in the paint cup. I focused on getting an nice even tint- slowly building it up with a wider spray pattern. The tinted coat was followed with three coats of clear gloss lacquer - and then I let the finish cure for a week and a half before wet sanding and buffing it out. The final product is pictured below - it has the original wrap-around "lightning bolt" bridge, some mid-60s Kluson tuners, repro knobs and pots and currently has a GFS P-90 pickup, though I may switch in a '64 Gibson P-90 once I find a cover that fits it correctly. The SG Junior is pictured here alongside some contemporary "brethren": a 1967 Kalamazoo KG-2 (by Gibson) in its version of Pelham Blue; a 1966 Gibson Melodymaker in very very aged Pelham Blue; and the 1965 SG Junior. I love this guitar and your post. Amazing restoration and repair work. It's nice that you stayed with this old guitar and seen it through. If it could speak I'm sure it would thank you for letting it see it's coming 50th birthday! Is there a name and manufacturer for the brand of Pelham Blue you used? Hi Scott - the color I used was from TCP Global in California - it's actually acrylic lacquer. They apparently also have a line of nitrocellulose lacquers - drop me an email and I can forward you the contact info and what to ask for if you want the nitro. The acrylic lacquer is available on their site using the Color Finder page - I forget off the top of my head what model and what year car color it is - but it is called Pelham Blue Poly.